With a climate in equal measure challenging and rewarding, the Cape and Islands of Massachusetts provide a bold canvas for any would-be tamers of this unique landscape. In these pages, C.L. Fornari offers expert advice with the warm and casual tone of a broadly knowledgable and informed friend. The author of many acclaimed gardening books, quite a number of them focusing on the Cape’s specific landscape and growing conditions, C.L. had lived and gardened on the Cape for twenty-five years herself. 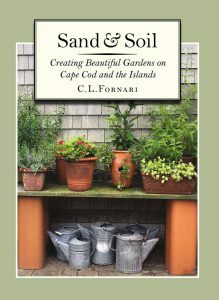 Drawing on her own experience, she deftly disentangles the many idiosyncrasies and potential pitfalls of growing a healthy and beautiful garden, both there and on the surrounding islands of Martha s Vineyard and Nantucket. Complete with an index to help you navigate the parade of flowers, fungicides, and footstools, Sand & Soil is the perfect how-to survival guide to assuage your horticultural anxieties and bring forth beautiful blooms from the sandy soil of this legendary landscape. Order Sand & Soil by clicking here or on the icon to the left. C.L.’s latest book is about creating a landscape where we can pause at the end of the day, put aside our digital devices, reconnect with nature and count our blessings. With or without an alcoholic beverage, the cocktail hour is a time to see plants being illuminated by the setting sun, watch hummingbirds come and go, smell the perfume of fragrant flowers and even pick herbs or fresh veggies to snack on. Be inspired to create a garden for the senses as you toast beauty and the wonders of the natural world. Order The Cocktail Hour Garden by clicking here or on the icon to the left. Word-of-mouth may be a great way to learn about some products, but word-of-mouth gardening tips can be a very bad idea. The age-old practice of passing along gardening tips and tricks is no guarantee you will get a good result…it might even do the opposite. 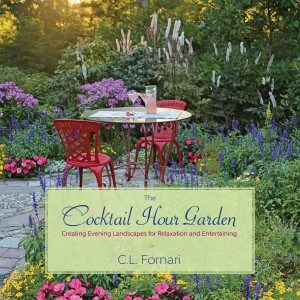 In her new book, garden expert C. L. Fornari looks at 71 common garden practices and uncovers the truth behind the lore. Do marigolds keep the bugs out of the veggie patch? Will rusty nails turn hydrangeas blue? With humor and affection, she goes back in time to sort out the good, the bad and the just plain silly…and tells us why. 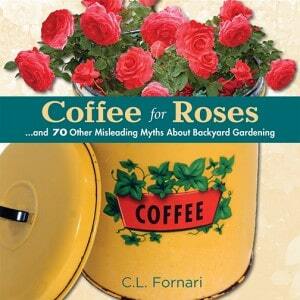 Coffee for Roses combines gardening history and expert advice into one useful, time- and money-saving package. The author’s award-winning full color photography is throughout. Order Coffee for Roses by clicking here or on the icon to the left. 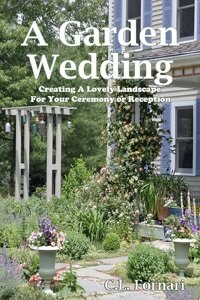 Order A Garden Wedding by clicking here or on the icon to the left. Buy the Kindle edition here. 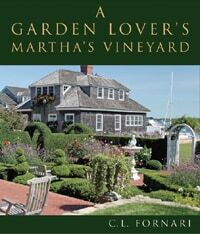 Order A Garden Lover’s Martha’s Vineyard by clicking here or on the icon to the left. With high winds, sandy soil, and a spring season that seems to stay cold forever, Cape Cod provides unique challenges to the creative gardener. So why do so many glorious gardens flourish here? C. L. Fornari has the answers. With 225 color photographs and a rich, informative text, Cape Cod’s own “Garden Lady” leads a tour from public parks to private properties. Along the way, she offers Cape Codders detailed advice on growing roses, hydrangeas, perennials, shrubs, vegetables, lavender, and so much more. For the Cape gardener, Fornari’s analysis, advice, and gorgeous photography will be an inspiration. For anyone who loves Cape Cod, this book will be a delightful tour of places where the beauty of the land matches the splendor of the sea. Order A Garden Lover’s Cape Cod by clicking here or on the icon to the left. The Cape Cod Garden is the first comprehensive source book for planting and maintaining beautiful gardens on Cape Cod, Martha’s Vineyard, and Nantucket. In these sea-sculptured lands, gardening is largely determined by sandy soils, moist off-ocean air, cool springtime temperatures, and wind. This book addresses the challenges posed by these lovely coastal landscapes and diverse growing conditions, providing hundreds of “how-to” tips for the gardener and home-landscaper. 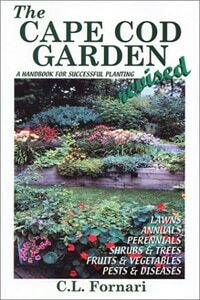 Practical information on choosing, planting, and maintenance of trees, shrubs, perennials, annuals, and fruits and vegetables is included. Here too are the least toxic ways to deal with pests and diseases, and a complete listing of plants recommended for the area. 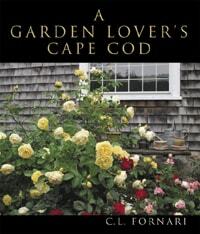 For beginners and experts alike, The Cape Cod Garden is an invaluable guide to the pleasures and challenges of gardening by the sea. Order The Cape Cod Garden by clicking here or on the icon to the left.